Winning the World Cup continues to be the ultimate dream for every international cricketer. The game's flagship event has enriched the careers of numerous players and embodied the legacies of several teams. However, the popular tournament has also provided quite a few heartbreaking moments for countries aspiring to lift the coveted trophy. Since the competition's inception in 1975, the pinnacle of the sport has seen plenty of upsets. Teams touted as favourites for going all the way have witnessed their dreams reducing to dust in a few pressure-filled moments of trepidation. 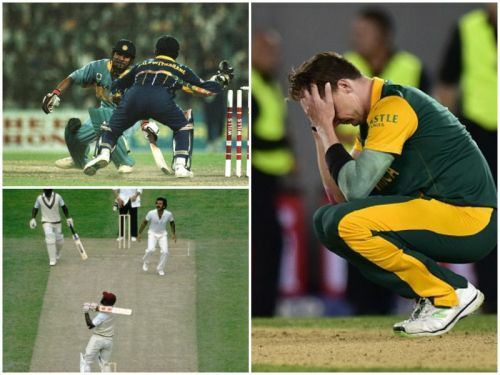 In reverse chronological order, let us relive five of the most heartbreaking moments suffered by promising contenders in World Cup history. Boasting several high-profile names such as AB de Villiers, Dale Steyn, Faf du Plessis, Hashim Amla and Imran Tahir, South Africa were considered serious contenders for the 2015 World Cup. Although they had an ignominious legacy of choking at the slightest hint of pressure, the Proteas were backed by plenty of former cricketers to break their trophy drought. Despite suffering defeats at the hands of India and Pakistan in the group stage, the tournament's format meant that they sauntered into the knockouts. A convincing 9-wicket victory against Sri Lanka redeemed their reputation even as the business stages of the tournament loomed. Winning the toss, South Africa amassed a strong total of 281 in the rain-truncated semi-final clash against New Zealand at Auckland. Amidst burgeoning expectations from their adoring fans, the hosts began their D/L re-enforced pursuit of 298 from 43 overs. Riding on skipper Brendon McCullum's blazing cameo, the Kiwis made a strong statement in the early stages of the chase. However, Morne Morkel's three-wicket haul set the stage for a pulsating finish. At a time when the home team should have been the one to feel the pressure, South Africa imploded in spectacular fashion in the field. Easy catches were dropped while straight-forward run-out chances were fluffed as a result of woeful gathering. Eventually, a rampaging Grant Elliot dispatched a length delivery from Dale Steyn into the stands and New Zealand cruised to their maiden final. 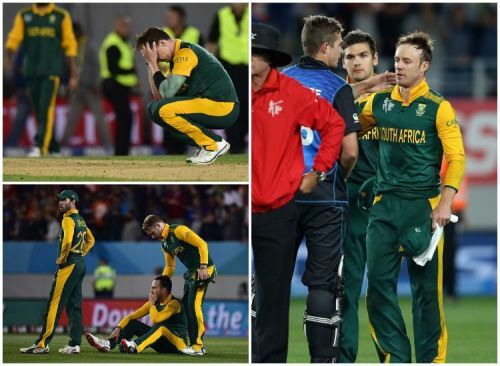 On the other hand, the star-studded Proteas sunk to their knees in palpable agony.